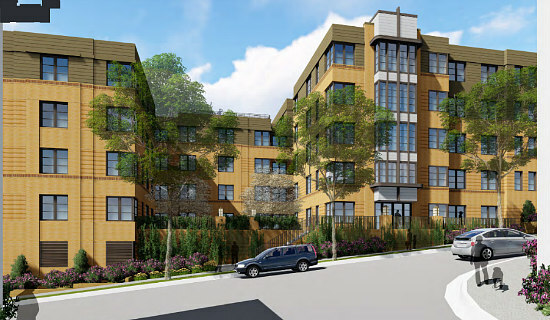 A rendering of proposed 100-unit affordable housing project on 50th street NE. The Economic Policy Institute estimates that most DC families with children must spend at least $80,000 per year to have an “adequate but modest” life in the DC metro area, which makes it extremely difficult for households with less than $40,000 to make a living in The District. In the maps below, you will find that most of the DC neighborhoods east of the Anacostia river file as “low-income” on their taxes. This map is showing us that between 2002 and 2013, the shares of low-income housing has risen in the outskirts of the Capital. This next map illustrates a comparison of singles and families living in the DC area over the same time frame. Families that made under $40,000 almost vanished from the neighborhoods within the zip code 20002— we are talking Eckington, NoMa, Trinidad, H Street. Oh, the same goes for the zip code 20003, which includes Capitol Hill and the Navy Yard. Well, where could they have gone? Well, look towards northern parts of the District near Columbia Heights, Petworth, and Brightwood Park. As daunting as this appears to be, our DC council members have been making strides for our families! Recently, more DC development projects are allocating space for affordable units in great neighborhoods with quality amenities for larger families. There have been several efforts made by the councilmen of DC to pass more legislation that would increase the number of affordable housing units in the nation’s capital. Back in early March, Councilmember Kenyan McDuffie proposed a new bill called the “Family Unit Amendment Act of 2017”. This legislation proposes that all future DC residential projects set aside 10% of their required number of affordable units to be constructed into 3 to four bedroom dwellings. The aim of this bill is to create more opportunities for low-income families to stay within the metropolitan area as opposed to moving out to BFE Maryland and Virginia. Following McDuffie’s bill, Councilmember Anita Bonds introduced a bill that would “draw from combined property-transfer and deed recordation taxes,” to increase the annual housing budget to $120 million. “Either $120 million would be taken from these taxes every fiscal year or 25 percent of the revenue generated by each of those taxes would be siphoned into the fund, whichever is greater.” A few years back (early 2015), Mayor Muriel Bowser committed a whopping $100 million annual budget to DC’s Housing Production Trust Fund (HPTF), which would help offset the cost of subsidized housing projects. More recently, The Progressive National Baptist Convention (PNBC) has teamed up with Atlantic|Pacific Communities and UrbanMatters Development Partners to propose a 100-unit, 70,712 square-foot, residential project on the Richardson Dwellings Campus in Lincoln Heights of Ward 7. The proposed development site is on Nannie Helen Burroughs Avenue and 50th Street NE, which is currently a surface parking lot on the western edge of the PNBC campus. This development team behind this project recently filed for a five-story building with 100 residential units, which would be reserved for households with no more than 60 percent of the area’s median income. These dwellings are expected to include a range of one to four bedroom units, a rooftop terrace, courtyard, and below-grade parking spaces. Urbanturf reported: “Out of the apartments, 35 would be replacement units for residents of the nearby Lincoln Heights and Richardson Dwellings. There would be a total of 56 one-bedrooms, 32 two-bedrooms, nine three-bedrooms (eight of which would be replacement units) and three-four bedrooms (all of which would be replacement units)”. This development is still in the proposal stage, and an official RFP for the site has not yet been released by the city, however, if you would like to hear more updates about the project keep following us!